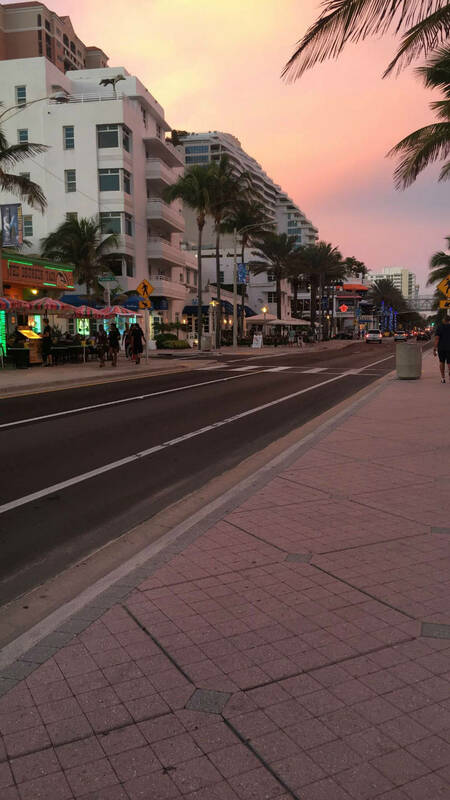 The beach looked killer around sunset last night. I honestly feel very lucky that I get to live and run here. 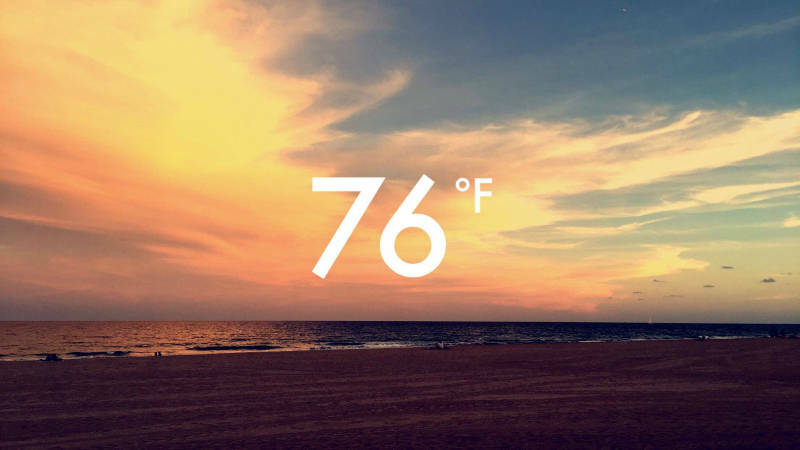 During the winter I always ask Santa for snow, but really this isn’t bad at all. The beach was pretty deserted except for runners which is just the way I like it. It seems like no one else besides us runners know sidewalk etiquette :). When I got home I had a lot of exciting stuff waiting for me. The other day I bought a new mirror for the gym (we’re not doing a full mirror wall) and Adam brought it upstairs for me. 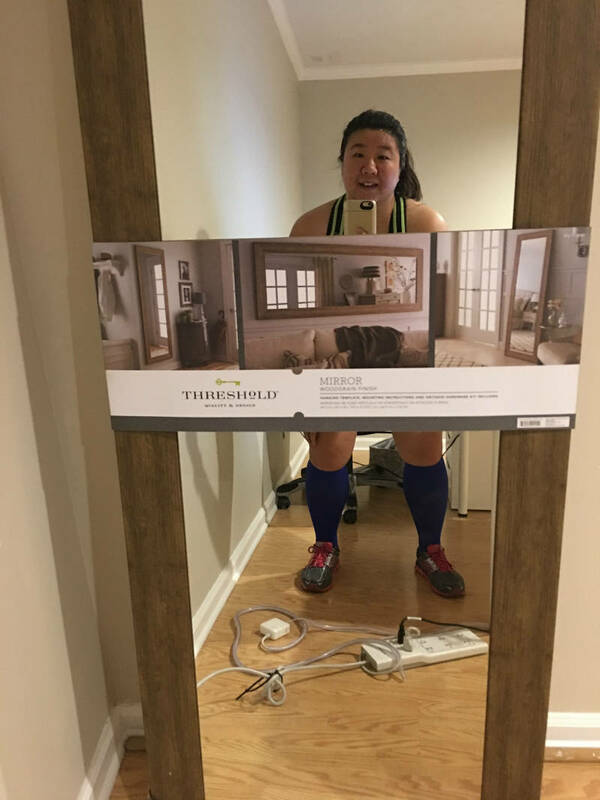 I am going to use this mirror to watch myself squat, hopefully with better form than whatever is going on in this selfie. 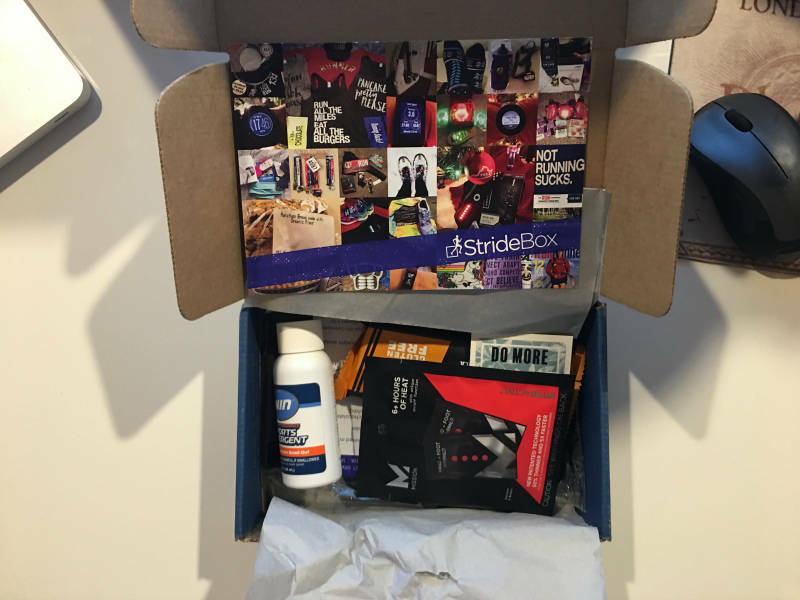 StrideBox also kindly sent me their new box which is filled with a bunch of goodies I want to try out. There are a few things in there that are geared towards cold weather runners only so expect another giveaway soon! Adam was hungry after his workout so he grabbed one of the protein bars from the box. I’m making him write a full review of it soon! I told him to take notes so he can give a good description and his honest opinion. I also received a much anticipated package with a couple of beauty products that were on backorder last week. I finally have my hands on NARS All Day Luminous foundation in the shade Barcelona, which was sold out almost everywhere last week. I ended up ordering it on Amazon from some shop on a very small island somewhere! Aaaaaaaaaand this amazing perfume arrived. I wish this picture was scratch and sniff because I really want you to see what it smells like! The scent is so light and beautiful! 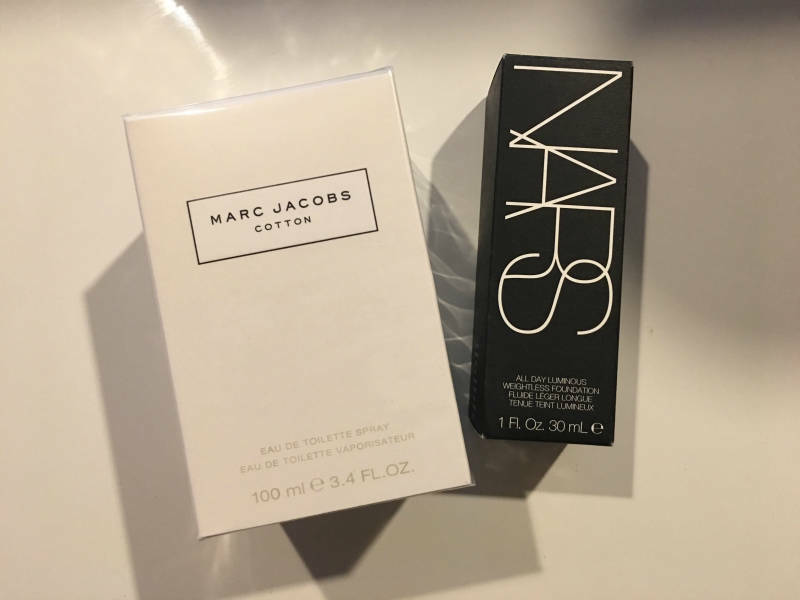 I also ordered Marc Jacobs Decadence, but I am having some issues with that. It was delivered via USPS and I cannot get into my mailbox! When we first moved in to the house we were still getting all of our mail sent to the apartment since we were still sleeping there. Well, now that we’re all moved in and about to no longer have access to the apartment we’ve started getting our mail sent to the house. Unfortunately, we realized last week that the previous owners did not leave us a key to the mailbox! We are trying to coordinate with our mail person so that we can swap out the lock for one of our own. Fingers crossed that we can meet with the mail person today! 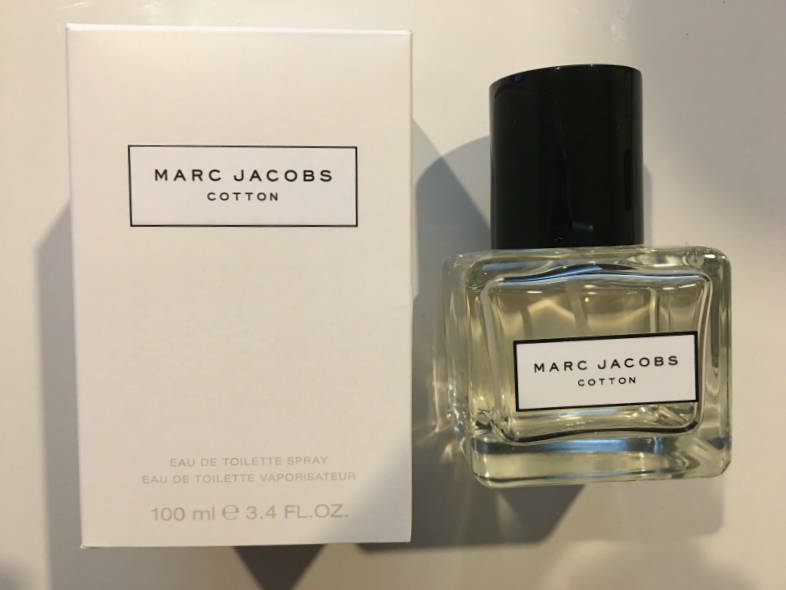 What is your current favorite perfume/cologne? 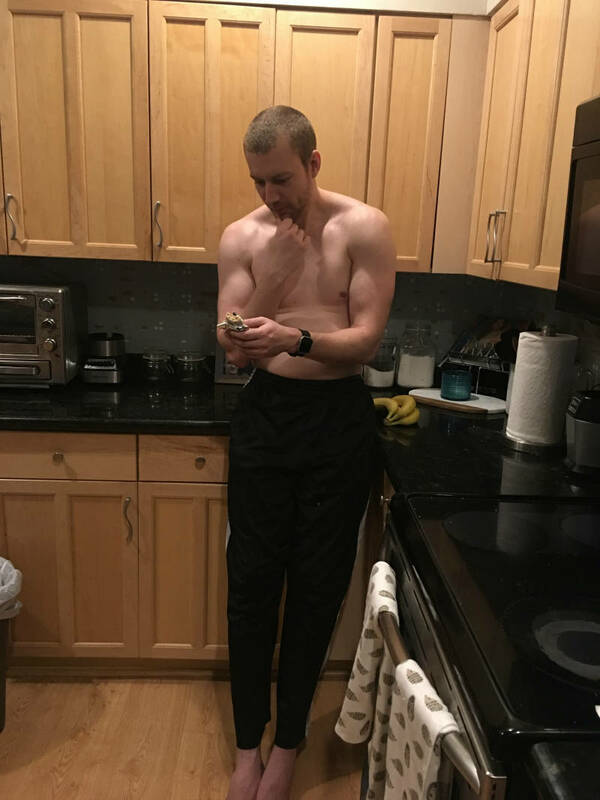 Previous Post Weekly Training Recap: Slow But Steady! Next Post 5 Workouts You Can Do At Home Or in the Gym! What a pretty sunset! I need a better mirror in the workout area of my basement. Then again not sure I always want to see how bad my form is! Hahahahaha 😀 You are so dedicated to the details that I find it hard to believe that your form would ever be off! Wow, it’s so beautiful there! I cannot wait to see how the home gym is coming along! It’s really so nice to have all that right at home–no excuses, right?!? I wear 3 fragrances–Marc Jacobs, Chanel and Bulgari. I love them all and most importantly they are “Rick approved”. That is important! I have been wearing Bora Bora since Adam and I started dating 12 years ago because he likes it! Adam?!?! Doing a review?!?! OMG this feels unprecedented lol. A lot of people ask for snow here in the valley too but on our worse day we have 45° which means we have to wear running pants…oh darn lol. Week was going good until i hit a roadblock today. I decided to sleep in. Stayed up too late watching a movie with Mrs Schlub and no way i was waking up early. That is a good reason for sleeping in later. That hardest part of getting up early now is sacrificing time with Adam in the evenings, 100%! That beach view is pretty incredible. Looks like a great place to run! Hahah that’s so funny! Even when Adam and I do have access to our mailbox we only check it a couple of times a week because we mostly just get JUNK! I LOVE LOVE LOVE Perfumes so it is hard to decided which one is my single favorite. I think Chance by Chanel is my all time favorite. I feel curious to smell that one you have there, so I might try it out next time I go to Sephora. Please do! It smells so good! There are three scents in this line from MJ. This Cotton one and oddly enough one called Cucumber smell amazing! Cold weather stuff for runner? oh! what is it? Right now, I love Coach poppy. I know it’s older, but it’s one of my favorites. Even though I am a Coach fan I don’t know what Poppy smells like! :-O What is wrong with me?! I don’t have a current favorite (I realized last year that my faves were all old and I need to get replacements!) but am not in love with anything enough. I need to head to sephora and lock myself in there, haha! I did get a gift certificate for a perfume workshop here in Chicago and am looking forward to trying that out hopefully in the next month or so! Good luck with the mailbox! I LOVE the colors of your sunset runs. The whole world is washed in pink and gold…so pretty!! !